I walk up through the charming upper section of San Miguel’s rural village towards its fifteenth century church that sits proudly on top of the hill, and the last thing I expect to see is luxury fine jewellery. And yet… this is exactly what meets my eyes. A kaleidoscope of sophisticated hand-made gold and colorful precious stoned jewels inviting me into Natasha Collis’s magical world. Set in a 300 year-old building Natasha’s shop and working studio is a kind of time capsule where time has stood still. Upon entering I soak up the sight of exposed beams, stone flooring, typical Ibicencan whitewashed walls and soft lighting. Immediately transported to another era, I feel inspired and can see how this space would have inspired the artist herself and infused her with the passion to create her intricate jewellery. Natasha moved to Ibiza from the busy streets of London over 10 years ago. After years of designing jewellery in London, Natasha discovered Ibiza on a weekend away. So enthused was she by Ibiza’s stunning natural landscapes, earthiness and scenic sunsets that she soon after set about making a permanent move over to the island. She tells me how she has made her home here in Ibiza because the island gives her the space to breathe. I completely relate. 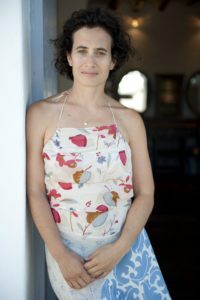 The friends she had met in Ibiza all lived in the Northern part of the island and Natasha felt drawn to this quieter, less populated, raw landscaped section of land. She tells me how discovering the more traditional artisan village of San Miguel was somewhat of a revelation. She instantly felt a kind of magnetic energy at the uppermost point of the village, soon prompting her to open her shop and studio there. Being close to nature in every day life is fundamental for Natasha and so she lives in a beautiful payes (peasant farmer) finca not far from her adopted village. 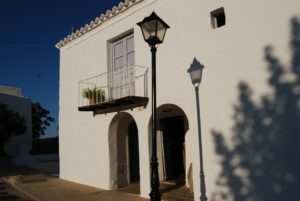 Despite the traditional foundation of the finca that indeed reflects what is known as a local farmhouse on the island, the house, now semi-reformed is a far cry from a peasant’s quarters. A simple yet colourful pied a terre provides Natasha with an expansive view of the sloping hills leading up to the town of San Miguel so that even when she is not in her shop, she can still appreciate the mystical church peaking its way into the clouds and so…feel inspired. Natasha is also fascinated by colour. This is reflected in the way she dresses and in the materials she uses in her work. 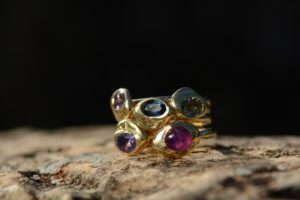 She celebrates the use of colour by using a large spectrum of hues in precious and semi-precious stones which fuse with the element of gold in a kind of perfect harmony. I look at her pieces and quickly understand that the stones have all been hand picked for the character they lend to the jewellery. I imagine how each piece has its very own story to tell the wearer and decide to try on a few to see which ones will resonate with me. I get stuck on about three pieces and finally can’t seem to decide whether I am feeling the emerald necklace or the pink sapphire ring reverberating most with my energy. Right, calm down I tell myself, just pick the one that is telling me the best story about Ibiza. The one that holds the most light as that is what will continue to fascinate me about this island, the amazingly changeable light the sky holds at all times of the day. I finally decide on the ring (and have a passing thought about what my husband will say), but this is soon enough forgotten as I admire my precious new purchase. I ask Natasha for suggestions of what to do next, now that I have my new ring I’m not sure where to go show it off first! Natasha suggests I do what she does on so many nights after work. First step, have a drink next door where I will watch the sunset in an equally antiquated and steeped in history estanco (tabac shop/bar). Then meander down the hill to her very favourite neighborhood restaurant, La Luna Nell’Orto. I keep to the plan and am again taken aback by the hidden away gem Natasha spends her evenings at. Another historical house in the village where Argentinean brothers have established their delicious Mediterranean restaurant. Once part of one of Ibiza’s first artisan and hippie markets, this authentically rural casa payes sits its eaters in a beautiful bougainvillea dressed terrace. I sit down, enjoy the breezy balmy evening and think that this is the end of yet another perfect day in paradise.